Anyone want to play "Name that Rash"?! 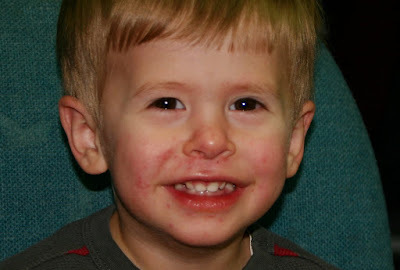 This kid has never had a rash or any sort on his face or eczema problems or food reactions so I'm kind of stumped with this one! It's a "pimply" sort of rash. I'm wondering if we picked something up while we were at the Children's Hospital in Denver, although we were only in the ENT area and he barely had time in the waiting area to play with any toys... He seems to be feeling fine otherwise. Any ideas?! It also resembles Impetigo. Melanie got it one time about his age..playing with rabbits and got a scratch. The bacteria turned it into impetigo. Poor Trey, I'm sure it's miserable. Are you using anything on it? Funny, his expressions remind me SO much of Ryan! Remember those pix of him I took at about this age of all his faces? LOL My comment/thought is that the 3rd picture is absolutely hilarious! HAHA I cracked up as soon as I saw it. Elaine, he hasn't been miserable at all. In fact, he doesn't have a clue he's even got it. He's normal Trey. And I first noticed it the 18th when they got home from Denver. It just got progressively worse for about 4 days and then it just started clearing up. One thing that helped tho was scrubbing his face good and just applying lotion, although Nish did start using Udderly Smoooth and that worked pretty quick!